Summary: Geek girl Elle Wittimer lives and breathes Starfield, the classic sci-fi series she grew up watching with her late father. So when she sees a cosplay contest for a new Starfield movie, she has to enter. The prize? An invitation to the ExcelsiCon Cosplay Ball, and a meet-and-greet with the actor slated to play Federation Prince Carmindor in the reboot. With savings from her gig at the Magic Pumpkin food truck (and her dad’s old costume), Elle’s determined to win…unless her stepsisters get there first. "Look to the stars. Aim. Ignite." Elle Wittimer grew up surrounded by Starfield, the old sci-fi show she adored and watched re-runs of alongside her dad. The show was the reason her parents met, the thing that bonded her and her dad so closely, the origin of the most important memories Elle has since her father died. Starfield truly is all she has left of him. Especially considering her real-life wicked stepmother is determined to sell their house -- the house Elle's dad left to her. It seems like Catherine has taken everything from Elle, and Elle feels powerless to stop her from taking more. If only she can win the cosplay contest at ExcelsiCon -- the convention her dad helped found so many years ago -- and take home enough money to finally get away from her stepmother and stepsisters and heal. And it's just icing on the cake if she gets a chance to confront Darien Freeman while she's at it. Darien Freeman also grew up surrounded by Starfield. As a kid, he found a place to belong within the storylines and characters, found solace in a world without deadbeat parents and nonexistent friends. Starfield was his second home. He knew every episode by heart, went to the conventions, imagined what it would be like to truly be in Federation Prince Carmindor's shoes. Now, years later, he has the chance. He's landed the spot of none other than Carmindor in the new movie reboot of the old show, and he can't believe he's really getting to do this. But the fandom of the show he's loved all these years... does not love him. His previous role on the teen soap Seaside Cove may have damaged his street cred, because none of the Stargunners seem to take him seriously; and one blogger in particular seems to downright despise him for taking the role. Between the less-than-thrilled fanbase and his less-than-caring manager/father Mark constantly standing in the way of his freedom and overall happiness, Darien isn't quite sure this experience is going to be everything he ever imagined after all. Despite the fact that it's all she wants, Elle's goal still feels out of her reach; and despite his love for the role he's finally claimed, Darien wonders if he should even be here at all. Their lives seem completely out of their hands. But when Darien texts the creator of ExcelsiCon to sort out a meet-and-greet issue, and Elle receives an anonymous text meant for her dad, they each find the one thing they've so desperately needed: a friend. And through this accidental friendship, maybe they can both find the confidence to stop being powerless. There were so many aspects of Geekerella that I absolutely adored. For one, the characters. Elle had to grow on me a little, and I wasn't always on board with her decisions; but she was likable and easy to root for. I felt for her and wanted nothing more than to see her win for once. I connected a little more with Darien; he was similar to Elle in that he was also likable and easy to root for, and his POV was also infused with plenty of humor and snark that made his chapters especially enjoyable. But another thing our main characters have in common is that they both put up with villains of sorts, and that brings me to my second beloved aspect. I absolutely loved how the characters in this book tied in with those in the actual Cinderella story. The wicked stepmother and stepsisters, the fairy godmother, the Cosplay Ball, the quest to find a mystery girl -- and so much more. I was so impressed with how beautifully the author intertwined fairytale with fandom. Speaking of fandom, this may be my favorite aspect of Geekerella. Being a fangirl myself of books, bands, TV shows, and a few other things, I related to Elle and Darien's love for Starfield. Hard. I really appreciated fandoms being cast in a positive light; it's not about obsession or not having a life. It's about finding a place to belong in a group of people just like you; it's about the happiness that one thing brings you, the lessons you take from it. The author's note at the end especially made me tear up; but the book as a whole stresses the idea that fandoms are not a bad thing and that there's no reason to look down at anything that brings someone joy, and that is such an important message. 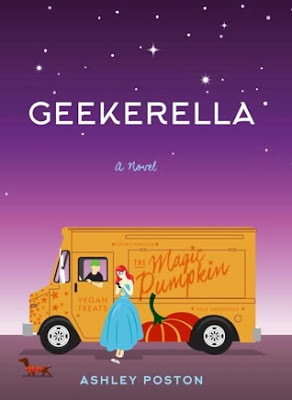 With its lovable characters, brilliant symbolism, and unabashed nerdiness, Geekerella is the perfect book for anyone who's ever found their home in a fanbase. Anyone who's ever found understanding in a book, a TV show, a band -- anything that brought them happiness and made them feel less alone. But even if fandoms aren't your thing, I believe there's something in Geekerella for everyone. There's heart and humor and captivating writing... and hope. Hope that maybe, even if it's through a TV show or a convention or an unknown number, things do get better. I'm incredibly grateful to Ashley Poston for giving this generation a book with so many important messages and morals and for helping to spread acceptance of fandoms and those in them. I can't wait to put Geekerella in the hands of all my friends (especially my fandom internet friends) and share even more of my love for this story. "We might all be different -- we may ship different things or be in different fandoms -- but if I learned anything from twenty-three days in a too-blue uniform playing a character I thought I could never be, it's that when we become those characters, pieces of ourselves light up like glow sticks in the night. They shine. We shine. Together. And even when some of us fall to different universes, those lights never go out... 'We're all geeks here.'" This book sounds so adorable and I cannot stand it! I love the Cinderella aspect and I love the fandom twist. I dont read much YA contempoaray anymore but I may need to make an exception for this one. Great review! Wonderful review. As a Whovian and Browncoat and Winchester wannabe..I think I could relate. Excellent review, thanks for sharing! This book sounds wonderful! I am sad that I didn't get my request answered. This sounds adorable. I want to read it. So glad I read your review. Aw, that makes me sad, too. I hope you will read it; I think you'll appreciate the Cinderella nods. It's the only time we'll be okay with evil stepmoms and stepsisters; it just works for this book.